North Korea has announced that the nation’s economic management problem will be solved through their “own style,” once again stressing the superiority of the Socialist self-reliant economic model and reiterating the need to construct a strong and prosperous nation. A September 3, 2014 editorial in the Rodong Sinmun argues the importance of economic management and leadership, saying that it must be improved to meet the demands of the North Korean economy, which has reached a new turning point in its development. “Economic Management System in Our Style” is North Korea’s new approach to economic principles originally stemming from Kim Il Sung and Kim Jong Il. The editorial emphasizes that it is a project that will bring real results and continuous development. Furthermore, the editorial argues that economic management and leadership must be carried out according to objective economic law and scientific reason in order to ensure the greatest possible economic practicality. The editorial also calls for conservation of national human and material resources as much as possible, as fundamental problems in building a strong economic nation and improving the life of the people, including the lack of adequate power and food, have yet to be solved. The roles of economic advising agencies and their workers were emphasized as being especially important. The editorial stresses that these economic advisers must become aware of the deep responsibility they hold, and must work to achieve real results in improving the country’s economic management. Finally, the role of the Cabinet was also emphasized as the commander of the economy. Specifically, the editorial calls for the strengthening of the Cabinet-centered system, in which the Cabinet should oversee all economic institutions and sectors and create policies accordingly. In addition, the Cabinet’s role to guide companies with scientific business and corporate strategies is emphasized so that they may actively engage in creative business activities. North Korea has been rolling out economic improvement measures since early 2012, starting with the agriculture sector. Since then, an “independent profit system” has also been introduced in various factories and businesses where managers are allowed more autonomy in managing operations, but are ultimately responsible for the business’s productivity. Beginning this year, the “business know-how” concept was applied to various farms and factories, and increased profits reportedly have begun to see their way back into the hands of the workers. The workers, whose job performance has increased due to the rise in profits, are seen as the driving force of North Korea’s economic development. It is necessary to settle the issue of economic management by Korean style in order to fully demonstrate the advantages and might of the Juche-oriented socialist self-supporting economy and win the final victory in the drive for building a thriving nation. The establishment of Korean-style economic management method is, in essence, the work to apply, carry forward and develop the principle and methods of economic management indicated by President Kim Il Sung and leader Kim Jong Il as required by the present times. It is necessary to hold fast to the socialist principle in improving the economic management. It is essential to ensure the maximum economic profitability by guiding and managing economy according to the objective laws of economy and scientific reason. In order to improve the economic management it is important to raise the responsibility and role of the economy guidance institutions and officials. It is possible to successfully achieve economic development only by working out a scientific economy development strategy, enlisting the natural resources and all potentials of the country to the maximum, ensuring a steady growth of production and keeping the overall balance of economy. The Cabinet is the economy command of the country. It is necessary to strengthen the Cabinet responsibility system, system centering on the Cabinet, concentrate all the economic fields and overall economic work on the Cabinet and take measures under the supervision of the Cabinet. The editorial calls for improving the economic management as required by the developing reality and intended by the party and thus giving fuller play to the advantages of Korean-style socialism and bring about a fresh turn in the building of a thriving nation. Here is a PDF of the web page should the URL go bad. It is worth noting briefly that this is what we have seen recently in recent consolidation of the JVIC, SEDC, and Ministry of Foreign Trade into the Ministry of External Economic Affairs. The only sign of activity at the North Korean trade promotion agency here in Beijing is the faintly lit banner in front, and it is hard to tell whether the office is open for business. No one is seen at the reception desk of North Korea’s Investment and Development Group building, located in a northern Beijing suburb, and its front door, though appears to be open, remains stationary for most of a weekday. “North Koreans are still working there,” said a Chinese cleaner near the building, who only gave his surname Wu. The Beijing branch of North Korea’s Investment and Development Group was believed to have launched operations early last year, but it appears certain to be a dead duck as the North’s unpredictability continues to keep Chinese investors away. Its website has not posted any statement since Jan. 23 this year, and there was no response to a phone call made on Aug. 16. A South Korean diplomatic source in Beijing, who spoke on the condition of anonymity, said the North Korean branch has been dormant since the North’s defiant launch of a long-range rocket last December. Tensions on the Korean Peninsula soared early this year, with North Korea conducting its third nuclear test and its near-daily war threats during an annual joint military drill between South Korea and the United States. “We have figured out that operations at the Beijing office of the North’s Investment and Development Group almost ground to a halt,” the source said. China, North Korea’s biggest trading partner and aid donor, has become increasingly frustrated with its wayward ally, particularly after the North’s February nuclear test. In May, the Bank of China closed accounts with North Korea’s Foreign Trade Bank, which was accused by the U.S. of helping to finance the North’s nuclear weapons program. According to the South Korean Embassy in Beijing, North Korea’s trade volume with China fell 6 percent on-year in the first six months of this year. The North’s trade with China stood at US$2.95 billion in the January-June period, compared with $3.14 billion a year earlier, embassy officials said. Exports to China rose 6 percent to $1.36 billion, while imports declined 14 percent to $1.59 billion, they said, citing official data. North Korea dissolved a well-known state-run company in charge of attracting foreign investment due to its unsatisfactory performance, South Korea’s Unification Ministry said Friday. “Daepung International Investment Group seems to have been disbanded, probably due to poor performance,” a ministry official said in a briefing on governmental and personnel changes taken under the Kim Jong-un regime over the past year. The country also broke up another extra-governmental organization in charge of trade promotion and foreign investment with its work believed to have been reassigned to the government’s Commission for Joint Venture and Investment, according to the official. Daepung Group was established at the instruction of the North’s highest political body, the National Defense Commission, in January 2010 as a means to attract foreign investment. 1. Previous posts on the Taepung Investment Group can be found here. 2. NK Leadership Watch has an excellend review of the organization here. 3. The “Commission for Joint Venture and Investment” is also known as the Joint Venture Investment Committee (JVIC). See JVIC posts here. Unfortunately for the North Koreans, actions speak louder than words. The North Koreans appear to be worried that the unwanted attention brought about by the Xiyang story will have a negative effect on investment in the country’s special economic zones along the Chinese border. In order to combat these growing negative perceptions among Chinese investors, the North Koreans have begun holding a series of invitation-only seminars to tout the benefits of investing in Hwanggumphyong and Rason. The officials told Chinese investors attending a seminar in Beijing that North Korea will allow the Chinese yuan to be used in business transactions, offer tax incentives to targeted industries and ease visa requirements. North Korea is hoping to spur development of the Hwanggumpyong and the Wihwa Islands, two special economic zones on the Yalu River, which also runs through the Chinese border city of Dandong, Liaoning Province, reported the Beijing News. Favorable policies regarding the Rason Economic Trade Zone, which is closer to Jilin Province, were also discussed. More than 200 Chinese companies, including State-owned enterprises and private corporations, participated in the seminar. China’s Vice-Minister of Commerce Chen Jian said cooperation between China and North Korea on the development of the new economic zones is going smoothly. Despite the enthusiasm from officials on both sides, entrepreneurs expressed concern over the veracity of the country’s legal framework needed to protect their investment. “North Korea has significant iron ore and coal reserves, but I wouldn’t rush to invest unless I am sure it can be protected by their law,” a Chinese mining entrepreneur who requested anonymity told the Global Times. The Chinese Ministry of Commerce has also moved to back efforts to stimulate interest in the SEZs. Cars pulled up one after another on Sept. 26 in front of the Bridge Art Center in downtown Beijing, where a big blue sign read “Introduction to the Choson (North Korea) investment environment and counseling on investment areas.” The Chinese corporate executives who stepped out of the vehicles filed into the venue for a briefing on investment in North Korea. The North Korean Committee for the Promotion of Economic Cooperation and China’s private GBD Public Diplomacy and Culture Exchange Center staged the event over two days in the hope of attracting investment by introducing “promising investment areas” for Chinese entrepreneurs. The event was invite-only. Attendees walked around the venue, where they were asked not to take pictures. A screen at the front of the conference room displayed videos on the Rason and Hwanggumpyong special economic zones and the tax breaks available to investors. Around 100 Chinese businesspeople sat in their chairs to watch. At the entrance was a list of around thirty participating North Korean businesses. Many were in areas such as natural resource development (iron and gold mining), seafood farming, and garments. Trade companies also stood out on the list, including the Daesong General Trading Corporation and the Jangsu Trading Company. Thirty-six officials from state-run North Korean businesses provided information about 43 investment projects. The afternoon saw one-on-one talks between North Korean officials and Chinese executives. A senior official with GBD said hundreds of Chinese businesses would be participating on Sept. 26 and 27. “There are quite a lot of Chinese businesses interested in investing in North Korea,” the official said. “Choson’s new leader Kim Jong-un declared that economic development and improving people’s livelihoods are important goals of the Workers’ Party of Korea,” they read. This is just one of many such briefings that North Korea has organized all over China. On Sept. 7, a counseling session was held in Changchun, Jilin province, for “North Korea Day and China-Choson trade investment projects.” Another investment briefing on Sept. 9 was staged concurrently with the 16th China International Fair for Investment and Trade in Xiamen, Fujian province. A joint China-North Korea economic trade briefing on Oct. 14 in Dandong, Liaoning province, is scheduled to include counseling sessions for the three areas of trade, investment, and labor between 60 North Korean national trade company officials and 100 Chinese businesspeople. Meanwhile, the Chosun Investment Office of Joint Venture and Investment Committee, North Korea’s body for attracting foreign investment, signed a contract in Beijing on Sept. 22 with China Overseas Investment to set up an exclusive North Korea investment fund of 3 billion RMB, or about US$476 million. China’s private investors have shown much interest amid signs of change from Pyongyang, but sources said this had not yet led to actual investments. “In staging investment briefings, North Korea is showing that it has decided on a course of change for the sake of the economy and the public welfare,” said a source in Beijing. “In China, people have kept asking for Pyongyang to establish more laws and regulations to allay the fears of businesses investing there, so it’s going to take some time to see the kind of investment North Korean really needs for its own economic development beyond things like mining,” the source added. But after listening to a presentation from Chinese and North Korean officials at one of Beijing’s most expensive hotels laying out the supposed allure of the two zones, the head of one company gave an emphatic “no” when asked if she was convinced. She nodded her head vigorously when asked if she thought it was risky investing in such an isolated and backward country. “Investors need first of all to consider the environment. If there’s a problem with the environment, then there’s no way people are going to commit money,” Li told Reuters. Pictured above: the signing of the contract between Xiyang Group and Ri Seong-kyu (리성교). Image source here. UPDATE 6 (2012-9-17): Andrei Lankov writes a good summary of events. Wu Xisheng, vice general manager of the Xiyang Group, told the Global Times Thursday that the company’s partner in North Korea was an enterprise affiliated with the Korean Workers’ Party, instead of what the country called a private entity. Wu also said Xiyang is one of dozens of Chinese companies who have been cheated by North Korea. Hu Chenpei, a diplomat with the business section of the Chinese embassy in Pyongyang, told the Global Times that it is “an isolated case of business disputes,” adding that both sides of the story are true. “We have been in contact with related departments in North Korea, hoping the two sides could iron out their disputes through rational discussions,” said Hu. When contacted by the Global Times, a diplomat with North Korea’s embassy in Beijing said he had never heard of the Xiyang Group and refused to comment. The North Korean spokesperson also said his government will continue improving its investment environment to further draw international investment, and protect the legitimate rights and interests of international investors who follow the principles of mutual respect, equality and mutual benefit as well as observing laws. Liu Ming, a researcher with the Shanghai Academy of Social Sciences, said the disputes have dealt a blow to Chinese enterprises’ confidence in North Korea. Xiyang told Reuters in an interview after the North’s statement that it had been “cheated” and it lambasted Beijing’s policy of propping up North Korea’s unreformed regime which it said that it was done for geo-political reasons. “It (Xiyang) has carried out only 50 percent of its investment obligations though almost four years have passed since the contract took effect,” KCNA quoted a spokesman for North Korea’s Commission for Joint Venture and Investment as saying. Xiyang refused to curb its criticism of North Korea when it spoke to Reuters, suggesting that Beijing was doing little to help companies that ran afoul of what it viewed as arbitrary rulings by North Korean officials. “This isn’t just about us – it is about all companies investing in North Korea,” Wu Xisheng, vice general manager of Xiyang told Reuters. 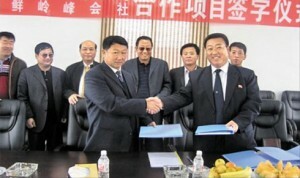 The Xiyang Group of the Haicheng City, Liaoning Province of China on August 2 posted on its Internet website an article criticizing the DPRK over the disputes that cropped up between the Group and the Korean Ryongbong Corporation in the course of implementing a joint venture contract for the development of magnetite concentrated ore.
After the article was published, some media echoed it before and after the report about the results of the third meeting of the DPRK-China Guidance Committee for developing two economic zones was made public. They added their own analyses to the article posted by the Group. They even aired what the anti-DPRK hostile forces reported in the past to malignantly slander the inviolable social system and policy of the DPRK. Generally, it is international usage and commercial ethics to settle disputes that occurred in the course of economic relations in line with the relevant arbitration item of the contract. But the media have kicked off massive propaganda campaign, defying international usage and commercial order. This cannot be interpreted otherwise than an act of fanning up the dishonest forces in their moves to drive a wedge between the two countries in their economic cooperation and chill the atmosphere for investment. As far as the procedures for the signing and implementation of the contract between the DPRK Ryongbong Corporation and the Steel Co. Ltd., of the Group and the bilateral disputes are concerned, the Group is also to blame for the abrogation of the contract. In the light of the process of implementing the obligations under the contract, the Group is chiefly to blame from the legal point of view. It has carried out only 50 percent of its investment obligations though almost four years have past since the contract took effect. So the two contracting parties again sat together only in vain over the timeline for the completion of the first-phase investment and commissioning. 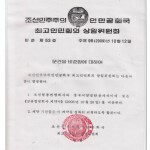 As for 16 provisions which the Group set forth as the major issue of the disputes, it is the legal obligation of the Group related to the contract to implement them according to the mutual contract in which both sides agreed on the article that “two sides sign it on the basis of the DPRK Law on Joint Venture”. As regards the dealing of sales price of trial products, the Group insisted on its self-opinionated proposal for settling its debts within the boundary of China, in disregard of the procedures in price dealing pursuant to the relevant financial management norms. Media should comply with the standards for fairness and objectivity, create an atmosphere helpful to settling the disputes between the two contracting parties and refrain from an act that can be misused by the hostile forces for their vicious propaganda. 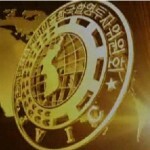 We will in the future, too, improve and round off the investment environment to further expand the international investment relations to meet the demand of the developing times and the lawful requirement of the international investment relations under the condition that the security of the country is guaranteed by dint of Songun. We will also ensure the legitimate rights and interests of all investors willing to develop international investment relations on the principles of mutual respects, equality, reciprocity and law-observance. 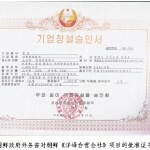 This appears to be the DPRK business license or registration. It claims that the Korea Ryongbong Ryonhap Company (조선령봉련합회사) and the Chinese Soyang Jipdan Corporation (중국서양집단공사사) “merged” to form the Yangbong Hapyong Company (양봉합영회사). The new firm is made up of 1,000 local employees and two foreigners. The investment terms also appear to be denominated in Euros. This image appears to be the cover sheet to the agreement between the two firms. The cover sheet states that this agreement has been approved at the highest levels and that both firms agree to be bound by its terms. China likes to claim that its relations with North Korea are “as close and lips and teeth” but those teeth are infected with a poisonous abscess so far as one Chinese company is concerned. In an extraordinary attack, a Chinese mining company has accused the North Koreans of tearing up a multi-million-dollar deal, intimidating its staff, imposing outrageous extra charges and cutting off its power and water, as well as of corruption and demanding prostitutes whenever their North Korean counterparts visited China. “Xiyang Group’s investment in North Korea was a nightmare, and we were taking our lives in our hands when we entered the tiger’s lair,” the company says. Xiyang Group, based in the northeastern province of Liaoning, says it was the biggest single Chinese investor in North Korea, having in 2011 signed a 240 million yuan (US$38 million) deal to form a joint venture iron mine that was to produce 500,000 tonnes of iron powder a year. The company aims much of its invective at a particular North Korean official, who, it says, is “the leader of the criminal gang who deceived Xiyang, this great plotter and fraudster …” The official, Ri Seong-kyu, was the North Korean side’s faren, or legal representative, in the deal and he is blamed for everything that went wrong. When negotiations began in 2006 the plan was for the Chinese company to take a 75% stake in the venture, but it turned out that North Korean policy stipulated that a foreign firm could own no more than a 70% stake in a natural resources company such as a mine. Xiyang says Ri, “violating the North Korean national investment law”, nevertheless signed a joint venture contract in which the Chinese side took a 75% stake, “forging an investment certification document in order to gain Xiyang’s confidence”. 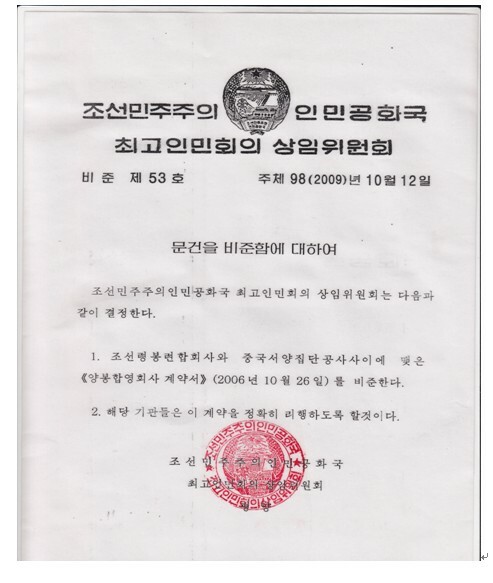 He later told the Chinese company that the document was null and void because of the stipulation that the North Korean side must have at least a 30% stake, but Xiyang did not realise his deception until September 2011. It also notes the secrecy that pervades business dealings in North Korea, which prevented Xiyang from sending ore samples back to China for testing, but despite all this the company “took the great risk of investing”. “North Korea’s system of doing business is [based on] government departments’ secrecy in relation to foreigners, and they do not allow foreigners to visit government departments to do business,” the online report complains. It says there were “all kinds of unimaginable serious problems” in reaching an agreement, but after years of negotiations production finally began in April 2011. However, the North Koreans unilaterally annulled the agreement last February, when they “used violent methods” against Xiyang staff, cutting off their water, electricity and communications and smashing the windows of their living quarters. At 2am on March 3, a group of 20 armed police and security officials led by a North Korean company official woke up the sleeping Chinese and told them the North Korean premier had annulled the deal and they were to leave the country immediately. Ten senior Xiyang employees, who seem to have been the only ones remaining in North Korea out of over 100 originally sent, were “treated as enemies”, put on a bus and deported via the border city of Sinuiju. Xiyang said it had paid over US$800,000 in kickbacks to corrupt North Korean officials, including $80,0000 for a Hummer for Ri in 2008 and $100,000 in 2009 for a construction project in which he was involved in South Hwanghae province. In addition, Ri and his cronies would demand gifts of laptops, cellphones and vast amounts of booze, and to be provided with masseuses. “Sometimes the Chinese would not provide any girls, so they would get them themselves and put it on their room bill,” expecting Xiyang to pay for all their personal expenses, bringing the bill to over 200,000 yuan per person. This was not all – they would demand a receipt for their expenses that had been paid for by Xiyang, so they could claim the same costs when they returned to North Korea, according to the Xiyang statement. Xiyang officials, on the other hand, had to pay all their own expenses in North Korea, were only allowed to eat in certain restaurants and were followed 24 hours a day by security officials. Even when Ri invited the president of Xiyang to his home, his host charged $2,000 for the privilege. The report says the crunch came in September 2011 when the North Koreans made 16 demands that violated the terms of the contract, including a 4-10% sales levy, a one euro (US$0.17) per square metre per year rent charge, a hike in electricity prices and a charge of one euro per cubic metre of sea water consumed. They also banned the company from releasing waste water, or even clean water, into the sea, which “amounted to the North Koreans forcibly halting production”. Many of Xiyang’s complaints will sound all too familiar to anyone who has visited North Korea. The document tells how Xiyang staff were at first banned from buying food in so-called free markets. After much pleading the authorities finally agreed to this, but each person had to be accompanied by two minders and the route had to be approved by the security police. Although the mine was only 500 meters from the sea, staff were banned from taking strolls along the shore. Quite why the North Koreans acted with such prejudice against Xiyang isn’t clear, but part of the reason may lie in the location of the mine. It is in Ongjin county on the west coast, a highly sensitive area ever since this small peninsula ended up in North Korea after the Korean war even though it lies below the 38th Parallel. (It is also close to the port of Haeju, from where the iron was to have been exported). The Chinese government may wish to dismiss this as a spat between a little known Chinese company and a single corrupt North Korean official, but it has brought into the open the deep suspicion that exists between the two countries. The Chinese have long felt unable to trust the North Koreans with their xenophobic, quasi-Maoist personality cult, while the North Koreans are equally suspicious of the emerging superpower on their doorstep eagerly eyeing the smaller country’s natural resources. Change may now be in the air, and the more open leadership style of North Korea’s young Kim Jong-eun has sparked speculation of economic reform and a fresh approach to foreign investment in his country, but horror stories such as this may indicate Kim’s style may be just that – all style and no substance. ORIGINAL POST (2012-8-10): JVIC is the DPRK’s Joint Venture Investment Committee. You can read previous posts about the JVIC here. North Korea has recently signed a deal with China to jointly develop three mines in the North, a North Korean investment firm said Thursday, as the cash-strapped country steps up attempts to earn hard currency from overseas. A Beijing unit of North Korea’s Committee of Investment and Joint Venture struck the joint development deal with a Chinese international trading company in Beijing on June 9, according to the unit’s Chinese-language Web site. “The China firm’s president and his parties conducted field inspections into one (North Korean) gold mine and two iron ore mines and confirmed the investment and development scheme,” the Web site said. “Facility building is now well underway for the project,” it said. Details on the terms of the deal were not provided. Experts said the deal is the first foreign investment deal announced by the Beijing unit, which is run by the Committee of Investment and Joint Venture in charge of luring overseas capital and investment into the North. The joint North-China mining venture also illustrates growing exports of underground resources from the North to China, its closest ally and a major source of foreign currency. Exports of mineral resources to China reached 8,420,000 tons during the first nine months of 2011, growing sharply from the annual volume of 4,799,000 tons in 2010 and 2,480,000 tons for the whole of 2008. Baoyuanhengchang confirmed the plans to develop the mines, as per its pronouncement, noting both parties had conducted field inspections. “Facility building is already underway and everything is going as planned,” it said. No details of the terms, however, were provided. The pronouncement has been considered a milestone as this was the first time that North Korea publicly announced its efforts in enlisting foreign investors to help develop its potentially vast mineral wealth, Arirang News reported. I have yet to determine in which specific projects Baoyuanhengchang is investing. The two most high-profile Chinese mining investments in the DPRK remain the Hyesan Youth Copper Mine (US$860 million, it now holds a 51% ownership) and the Musan Mine (50year lease). The original Musan deal may have fallen through, however, and could possibly be one of the deals included in the Baoyuanhengchang agreement. A Chinese conglomerate that tried to advance into the North Korean mining industry has been forced out of the Stalinist country due to contract cancellations. Calling its past five-year investment in the North “a nightmare,” Xiyang Group has filed for arbitration with the Chinese government. Based in Liaoning, China, the group said Wednesday that it had set up a joint venture with North Korea in March 2007 to build a plant there that extracts iron from ore. Of the paid-in capital of 47.52 million U.S. dollars, the company put up 75 percent of the amount in cash and North Korea 25 percent for land and mine exploration and also managerial rights for 30 years. Xiyang company invested 37.14 million dollars, the biggest investment for a Chinese private company in North Korea. Pyongyang approved the incorporation in April 2007. With a target of 500,000 tons of ore dressing per year, Xiyang sent about 100 workers to North Korea and produced 30,000 tons in April last year. In September last year, however, Pyongyang requested modification of 16 items on the contract including a demand of 4-10 percent of sales of products for using raw materials; 1.24 dollars for every square meter of land leased, and 17 cents per cubic meter of sea water for industrial use. Xiyang said the demands were not included in the original contract, which was ratified by the North Korean parliament in October 2009. The conglomerate refused modification of the contract, prompting Pyongyang to suspend the effectuation of the contract and cancel corporate establishment Feb. 7. North Korea also suspended power, water and communication supply at the plant. Xiyang said that on March 3, North Korean police and 20 security guards went to where the Chinese workers were staying and forced them to ride a bus to deport them outside the Chinese border. The group said the North requested modification of the contract to steal the ore dressing facility that the country lacked in capital and technology to introduce. So the North Koreans are violating a contract which was ratified by the Supreme Peoples’ Assembly? That does not inspire confidence. Via Choson Exchange, here is a link to Xiyang’s official statement. You can read it in English via Google Translate here. In case the web site is taken down, I have created a PDF of it which you can see here. It is not really worth the time speculating on the politics behind the scenes. The Daily NK, however, points out that the KPA’s privileges with respect to mineral exports are being curtailed. 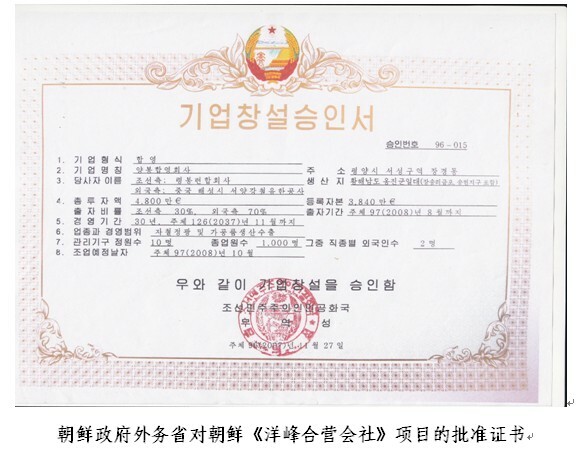 In 2007 Xiyang set up the Sohae Joint Venture Company to work the Ongjin Iron Mine (Google Earth coordinates: 37.960294°, 125.368651°) and the Xiyang Paekgumsan Joint Venture (aka Soyang Paekgumsan Joint Venture Co.) to work in haevy industry and construction. Although the story does not mention it, I believe the problems are at the Ongjin Mine. I am unsure of the status of the Paekgumsan Joint Venture. The Beijing branch of the Joint Venture and Investment Committee of North Korea (JVIC), called the Choson Investment Office, announced on July 18 of various preferential conditions to foreign investors and employment conditions on its website. The Choson Investment Office opened its doors this year and is the only overseas branch of the JVIC, in charge not only of securing foreign capital but cultural and science and technology exchanges and cooperation. The website posted an article titled, “Problems Investors Face,” which provided useful information for foreign investors in a question and answer format. In the article, the employment conditions for workers were included. The minimum monthly wage for workers in North Korea was set at 30 euros or about 42,000 KRW. In addition, foreign companies must pay 7 euros to each employee separately as social insurance. Overtime pay also needs to be paid and at the event of work related injuries or illness, the company is responsible for handling the situation with its board of directors. In comparison, the minimum monthly wage for North Korean employees in the Kaesong Industrial Complex (KIC) is 110 USD or about 125,000 KRW. As for preferential tax policies, foreign-capital companies that are not joint venture are exempt from certain taxes including tariffs on exports and resource tax for the development of mines. North Korea will bear the land use tax, which is 1 euro per square meter, and China and other foreign investors will have no restriction for mining the underground resources. The income tax rate for the foreign capital companies was specified at 25 percent and business tax between 2 to 10 percent will be collected from transportation, power, commerce, trade, finance, insurance, tourism, advertisement, hotel and entertainment industries. Power is the main concern for most foreign companies and it will be provided at 0.053 euro per 1,000 kilowatt. The DPRK’s central trade guiding organ will oversee the setting of prices of goods while the trademark rights will belong to the company. The DPRK’s Joint Venture and Investment Committee was expanded and reorganized in July 2010 from Joint Venture and Investment Bureau, with main activities centered around Hwanggumpyong Island and Rajin-Sonbong development. The main agents for foreign currency earnings are the cabinet, military, JVIC, and Daepung International Investment Group*. Most of the trading companies are affiliated with one of the four groups. The Democratic People’s Republic of Korea is willing to further improve its environment for foreign investment, Yun Yong Sok, a vice department director of the DPRK Committee for Investment and Joint Venture, told KCNA. The nation’s economy is gaining momentum, with many industrial establishments and power stations being built across the country. It is a consistent policy of the DPRK Government to enhance economic cooperation with other countries, while beefing up its self-reliant national economy. In December last year, the government amended investment-related laws, including the DPRK Law and Regulations on Foreign Investment, laws on joint venture and joint collaboration and the Law on Foreign-funded Businesses and Foreigners’ Tax Payment, in step with the nation’s developing economy and international practices. It enacted the law on economic zone on Hwanggumphyong and Wihwa islets in the River Amnok and revised and supplemented the law on the Rason economic and trade zone. Contracts on joint venture and joint collaboration have been on increase with the investment environment changing for the better. The committee will pay deep attention to ensuring the interests of foreign investors, while invigorating the exchange and cooperation with governments, investors and businesses. In other news, KCNA has adopted the American colloquialism “beefing up”. North Korea is likely to make an official announcement of its new economic development plan in April to commemorate the centennial anniversary of Kim Il Sung’s birthday, which is also celebrated as a national holiday in North Korea as the “Day of the Sun.” In addition to the new economic plan, North Korea is also planning to align organizations and establish appropriate legislations in the foreign economic sector. The Daepung Group was recently consolidated with the Joint Venture and Investment Committee (JVIC). The WPK Director of Administration Jang Song Thaek is in charge of the Daepung Group and the JVIC and is likely to have ordered the merge of the two organizations to increase work efficiency. Kim Yang Gun’s position as the head of Daepung weakened after the souring of inter-Korean relations despite his efforts to bring investment from the South. As a result, Kim will likely step down from his position and Pak Chol Su and the executive management of the JVIC will likely manage the Daepung Group in the future. The JVIC has also faced changes in its organization with the appointment of Ri Gwang Gun as the new head of the JVIC. Other foreign investment companies and related organizations were merged and the roles of the directors were revised. The Beijing office of the JVIC has opened its doors in December 30 last year. North Korea is likely to dispatch experts and professionals from various organizations to provide “one-stop service” to attract more investment to North Korea, starting from this April. Kim Chol Jin is the person in charge of the JVIC Beijing Office. The Rason Special Economic Zone (SEZ) and Hwanggumpyong SEZ will have a change in leadership, as Hong Suk Hyong will replace Kim Il Young as the new vice-chairman. The previous chairman of the JVIC, Ri Su Yong, who was also the former ambassador of the DPRK to Switzerland, is now serving as the new advisor to Kim Jong Un at the Secretary’s Office. *Addendum: Choson Exchange has been talking about this for a couple of months. See posts here (2012-3-4), here (2010-2-13) and here (2012-1-10). You are currently browsing the archives for the Joint Venture Investment Committee (JVIC) category.